Will you be at Poshfest this year? It’s Poshmark’s annual conference + party. It’s less than a month away and you still have time to get your ticket. Tickets are available through Eventbrite (and will not be sold at the door). Poshfest is happening October 1-2 in LA and is most definitely going to be awesome!! Are you on the fence about going though? Here are all the reasons that you should seriously consider going to Poshfest. First of all, there will be a highly-requested breakout session teaching you how to turn your Poshmark closet into a legitimate business. That will include when to make the jump and get a business license, ideas for managing your inventory and record keeping, and how you will need to handle taxes. There will be a panel discussion explaining marketing strategies to double your sales AND how to keep customers coming back with stellar customer service. Umm, yes please! You will learn how to identify your own specific niche in the app so you can focus on a narrower target audience and attract them to your closet. They will also be going over where to get inventory for your closet. Yes, the wholesale portal is a big part of this (since they run it and all), but they will also be talking about other sources. And not just other wholesale sources, they will explain exactly how to score huge wins at thrift stores and sample sales. And if you really want to amp up your business, you can learn how to start virtual consigning, even if it’s just for your friends at first. Poshmark will be spilling all of their data-backed details on best selling brands and styles. Data driven secrets will also include the best times of the day to share your closet and the best-selling price points. Amanda, Poshmark’s social media expert, will teach you the best strategies for how to create compelling content and share it on various social media platforms. And they will let attendees have access to early info on some major brands coming to the wholesale portal. Manish himself will talk about how far Poshmark has come and, most importantly, where it is going. You will be the first to hear his plans for what’s coming next. The addition of men’s and children’s categories was HUGE, right? So imagine being the first to know about the next jaw-dropping features! Have you noticed how a large majority of poshers are more than willing to help each other and to teach newer poshers the rules and how to be successful? Well at Poshfest, you have access to all sorts of in-person mentorship that will help you no matter how new or experienced you are. Talk about where to take your closet next. Get tips on maintaining a good posh-life balance and how to run your business on-the-go. You can be personally coached on creating gorgeous cover shots with sessions on how to master flat-lays and how to edit your photos to make them look fabulous. Receive a personalized closet consultation that will go over everything from your listing photos and descriptions to inventory. You will get your hands on all sorts of Poshmark branded goodies. Stickers, pencils, bags, and many more surprises! As a bonus, you can use the Poshmark stickers to wrap up some of your sales and make your closet look SUPER legit. You could also use Poshmark branded goodies as freebie gifts with larger orders or bundles. Or you could incorporate Poshmark swag into some of your flat lay cover shots. How cool would that be?! Take advantage of the networking opportunity. You will have the chance to meet tons of other Poshmark sellers like yourself. You will also get to meet some sellers who are just killing it on the app and have figured out how to turn their posh addiction into a full-time business. Some ladies are even making over 6-figures! How cool would it be to meet those ladies, get to know them, and discover what they did to be successful? Poshmark Headquarters will be throwing an epic bash with DJ Lady Sha. There will be cupcakes, an open bar, dancing and a fashion show. A whole lot of fun is getting ready to go down! Party with your favorite poshers and reward yourself for all of the hard work that you have been putting into curating and sharing your Poshmark closet. Can you see the value? After outlining all of these benefits, it would be obvious that I would go to Poshfest myself, right? So while I would love to be at Poshfest, the timing just really didn’t work out for me this year. But I fully intend on making it to Poshfest next year! It’s seriously a no-brainer for the serious posher. And that doesn’t mean that you have to have been using Poshmark for a long time to get real benefits. It will be amazing for brand new users too! So I highly recommend going if you can swing the trip out to LA. Bring on the ultimate posh party!! 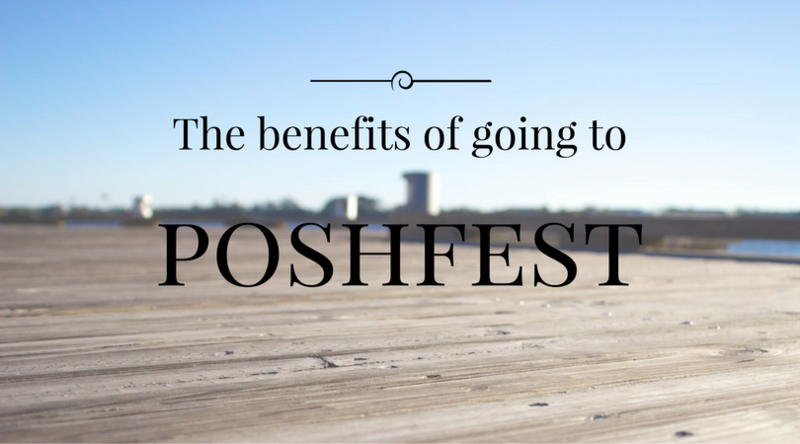 Are you planning on going to Poshfest this year? Or still trying to decide whether or not it’s for you? Let us know in the comments! This entry was posted in Poshfest. ← How do I get a host pick on Poshmark? until May and it slowed down tremendously. that helped me to understand the stall. I will take your ideals and run with it. 50% off the selling price. After many lowballing I decided to put a listing up on asking for reasonable offers and included a chart for reasonable amounts and percentage. I hope that didn’t deter my sales.